The gown consists of a necklace inspired (beaded) neckline, with alencon lace cascading down the bodice. A satin beaded belt nicely cinches the waistline. The A-line gown is finished with scattered lace appliques and it has a full volume tulle skirt. The gown has a stunning laced back with buttons cascading down from the neckline to just below the waist. It has a sensible train that creates a beautiful silhouette but practicality for walking. The fabric consists of corded Alencon Lace, English Net and Organza. It is an ivory gown. 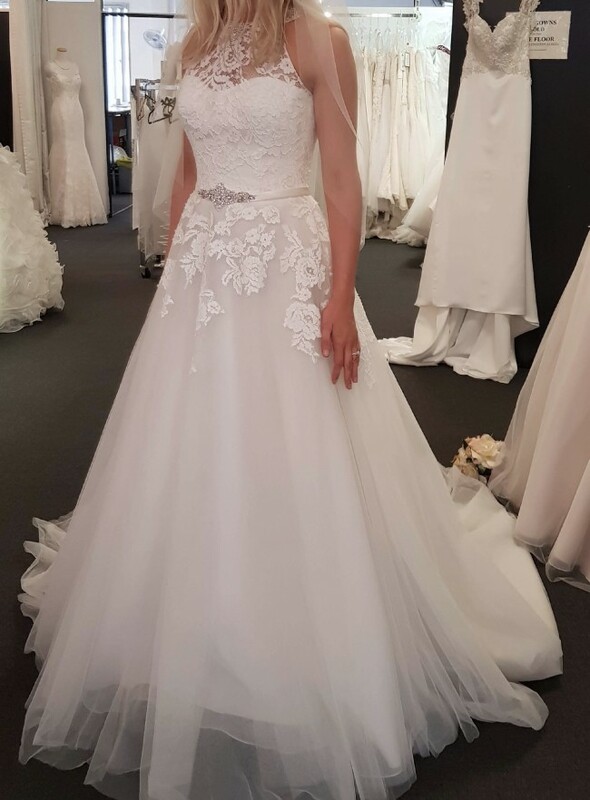 This gown would suit brides who like a classical, elegant look and whilst they want to look stunning, they still want to feel comfortable on their day. Sample dress, never worn for a wedding. No alterations. Not made anymore, last of its kind. Rare and unique. Lace bodice trailing down skirt. Button up back. Embellished neckline and waist belt. Halter style, full skirt, beautiful train. Size 8 is true to size. Doesn’t run small nor large. Once you send a message, Emelye can invite you to purchase the dress.